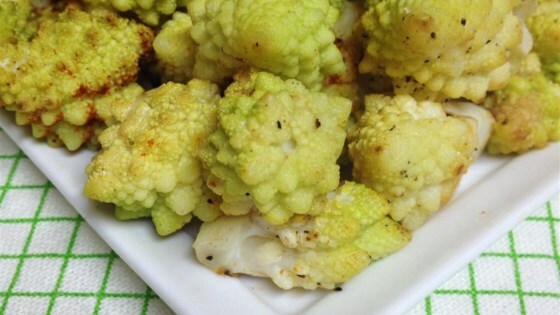 "This crazy looking vegetable is better than broccoli!" Spread Romanesco onto the prepared baking sheet; drizzle with olive oil and season with salt, black pepper, garlic powder, and paprika. I used some crushed fresh garlic in the oil and gave it a few drops of balsamic at the end. It is a delicate veg so it doesnt need much. I substituted minced garlic for the garlic powder and it was delicious! I just had broccoli and cauliflower but otherwise followed the recipe and it was great. It's super easy too. So much better than broccoli. I will buy romanesco more often now! Love, love, love this recipe! Now adding broccoli and cauliflower with the romanesco. Awesome blend! Indeed a crazy creature of a looking veggie but very yummy! Yummy and very easy to make. Great for anyone who wants a healthy and quick side dish. We roast most of our vegetables this way so it's not a new way of doing veggies but the Romanesco was new to our family. What a great vegetable and a great way to enjoy it. It is delicious and easy to prepare, half of our family liked it.